Designed for normal to thin hair. Improves texture and shine. The Jaspe Oval Hair brush with natural bristles brings out your hair’s natural shine by distributing its natural oils and repairing dry ends. Improves hair texture and stimulates the scalp. Never mass-produced, each brush is made by hand. The Jaspe collection features an iconic tortoise shell design, making it one of our customer favorites. Handle and body are made of cellulose acetate with a gold-stamped logo. 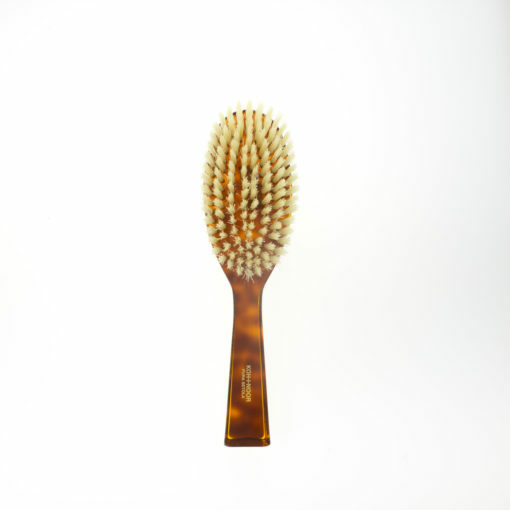 This hair brush has natural boar bristles specifically designed for fine or thin hair. Care: Remove any excess hair from your brush and swirl the brush in a bowl of lukewarm water with a little shampoo in the water. Rinse thoroughly, removing all soap, dirt, hair and oils. Air dry. Handle and body are made of cellulose acetate with a gold-stamped logo. This hair brush has firm natural bristles and is good for all hair types. I love how easy styling my hair has become. This brush really brings out my natural waves. Love it! My hair is on the thin side and I color it so it gets dry. This brush actually made my hair healthier, shinier and I wash it less because it looks good longer. I am on the go all the time and don’t have a lot of time to style my hair in the morning. This brush does wonders and really brings out the shine without any products at all!